In a world where technology picks out our clothes, tells us how to get to work, recommends where to eat, and who to date, we’ve become pretty comfortable relying on computer software to help us make decisions for almost every aspect of our lives. Machine learning has revolutionized so many industries – and soon it will impact how recruiters hire for their organizations too. For years, recruiting has been compared to dating. Recruiters are the matchmakers, looking to create a spark between a candidate and a company – hoping for a long-lasting fit. The hiring and onboarding process can be compared to courting someone in a new relationship. Employee referrals are just like setting up a friend on a date. Similar to how dating was brought into the digital age with online dating sites and dating apps matching people together in relationships, recruiting software is moving towards matching people to jobs and bringing employers and candidates together for a perfect match. Technology empowers us to make sound decisions and offers up suggestions we may not have find on our own. In dating situations, we often trust a recommendation from a dating app more than our own heart. There are several benefits to utilizing machine learning in these situations: finding a match quicker, allowing technology to weed out any mismatches, and possibly a better chance for long time happiness. The same concepts apply to recruiting as well, helping recruiters save time and money and find the perfect match for each role. At its core, machine learning is about making smart predictions through data. When it comes to recruiting, those predictions can be helpful to quickly pinpoint qualified applicants within a large pool of candidates. It can be helpful to search for relevant keywords, qualifications, and even locations within job requisitions without having to search through your database one search term at a time. The concept is not to remove the human element of recruiting, but to help recruiters be more efficient in their jobs by automatically recognizing trends and patterns within data. One of the key benefits of using machine learning in the recruiting process is to remove bias. Algorithms are used to assess candidates and predict if they will be a good fit for any given role. Rather than relying on the opinion of one recruiter or hiring manager, HR professionals can make a data-driven decision. This may seem like recruiting in the next century, but some progressive hiring companies are already using aspects of machine learning in their hiring process, or preparing for how they will use this technology in the future. HR teams will begin to rely more on data to save time and money and better connect candidates and recruiters for a perfect match. Think of all the success stories ahead. 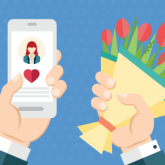 Machine learning resulted in numerous happy marriages leading people to their soulmates through data, could it help recruiters find their dream candidates too?